Campaign Sign for Democrat Jim Langfelder for City Treasurer for Springfield, IL. Mr. Langfelder held the office for three terms from 2003-2015. Campaign sign is either from his 2003, 2007, or 2011 election bid. After serving as city treasurer, Mr. Langfelder successfully ran for Springfield Mayor in 2015. Campaign Sign for Jim Langfelder for City Treasurer (D) for Springfield, IL from either his 2003, 2007, or 2011 election bid. 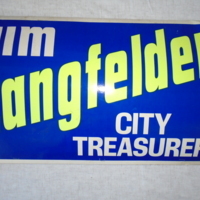 “Campaign Sign Jim Langfelder City Treasurer (D) for Springfield, IL,” UIS History Harvest, accessed April 19, 2019, http://uishistharv1.uis.edu/items/show/124.